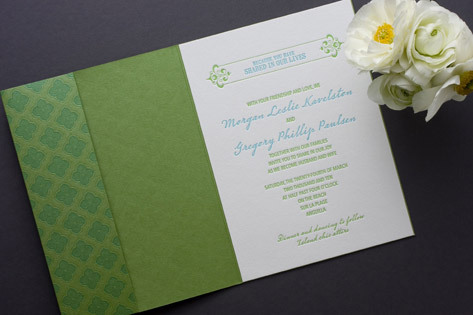 These super snazzy letterpress wedding invitations will get your guests' attention with a bold, patterned jacket and lovely letterpress detailing. The invitation suite has subtly exotic travel motif, appropriate for destination weddings, and the pocket inside is the perfect place to have day-of pieces so your guest will have no troulbe finding their way to wedding events. Available in chartreuse/sea (shown), raspberry/sunflower, and sea/tangerine.